De Swimovate Pool Mate 2 registreert afstand en snelheden in zwembaden en in open water. De Pool Mate 2 beschikt ook over een batterij met langere levensduur en een heldere, grote display. A simple calibration lap is all that’s required to set up the special open water mode, which uses the in- built accelerometer to work out the swim metrics. Using this method rather than GPS, which takes a lot of power and has difficulties operating in water, means the PoolMate2 has a battery life of over 2 years! The open water mode is a swim pedometer. Swim a lap of a known distance first and follow the calibration instructions then the watch will use this information for subsequent open water swims. Recalibrate regularly for best results. The PoolMate contains MEMS accelerometers (first used by NASA) to capture the motion of your arms. Our software times your swim and calculates lap count, average strokes, speed, calories and efficiency levels so you can work on improving your technique. 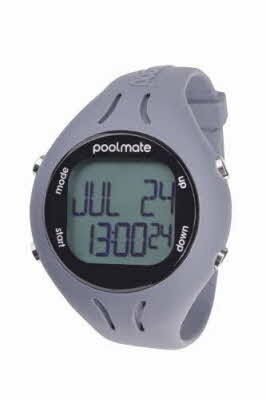 We have been selling our PoolMate watches for over 5 years all over the world. Before we launched the PoolMate had been extensively tested by a wide variety of swimmers over a 2 year period. We have a database of hundreds of kms of swimming and an accuracy rate of over 99.75%. There are tens of thousands of PoolMates being worn everyday and helping swimmers all over the world. The watch has full CE and FCC approvals. Patents and trademarks granted.